Researchers at the University of Notre Dame’s Eck Institute for Global Health have coauthored a paper recently published in the journal Science that announces the genome sequencing of Culex quinquefasciatus, the southern house mosquito. Additionally, the laboratory of David Severson, professor of biological sciences, has published a paper in PLoS ONE that uses the genome sequence to study microsatellite distribution in the mosquito. 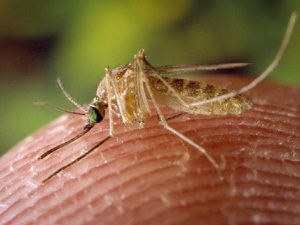 Culex quinquefasciatus is the primary vector for lymphatic filariasis in some parts of the world and for West Nile virus in the United States. Genomes for Aedes aegypti, associated with dengue and yellow fever, and Anopoles gambiae, associated with malaria, had been sequenced earlier. Severson’s lab, and VectorBase, a leading repository of arthropod genome information for research funded by the National Institutes of Health, participated in the sequencing with researchers from a global network. In addition, VectorBase was involved with a companion Science paper that analyzed the Culex immune system. While Aedes and Anopheles breed mostly in relatively clean water, Culex breeds in polluted water, even septic pits — likely a reason for its expanded set of genes that deal with detoxification and could make it resistant to insecticides. Severson and Aiko Mori, a research associate professor in biological sciences, have long worked on the genetics of the mosquito, research that provided information allowing the group to assign at least part of the sequence information to a particular chromosome region. “This sequence assembly, with nearly 19,000 protein-coding genes, should stimulate more research on the inadequately-studied vector, beginning with the PLoS paper that reported methods for the rapid and efficient identification of single locus, highly polymorphic microsatellite markers. Eight researchers from the Eck Institute for Global Health were coauthors on the study published in Science. Their coauthors include researchers from 38 universities, government agencies, and institutes both in the United States and many international sites.